Leica is known for making high end, wallet-emptying, rangefinder cameras - so it was a surprise last month when it announced a sub-£500 instant camera. We couldn't wait to get out hands on this quickly little camera. It's one of the most affordable entries into Leica brand, but is it worthy of that little red dot? We've gone hands-on to find out…. 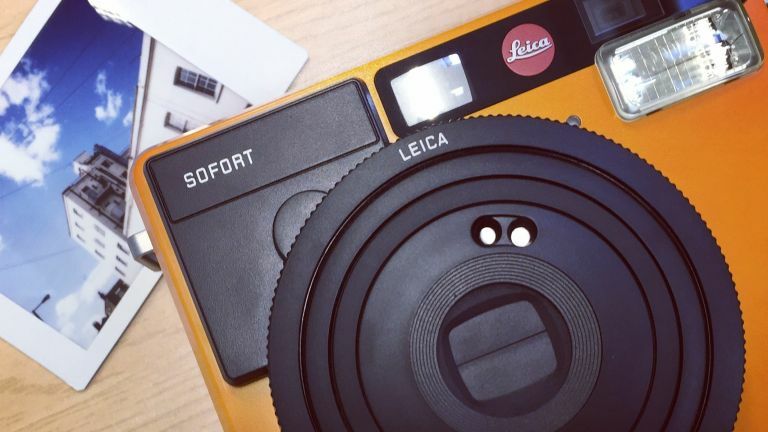 The Leica Sofort looks amazing. We love the retro boxy design and classic colours it's available in (orange, white and mint). It measures 124 x 94 x 58 mm, so while it fits nicely in the hand, it won't fit in your pockets, unless you have very large pockets. It's lightweight at 325g. We quickly became the envy of the office as well, with people unable to resist picking it up and playing with it when walking past. The front is dominated by the large lens, viewfinder window, flash, the Leica red dot, and a small mirror for composing selfies (because, of course you're going to take selfies with it). The rear features a monochrome LCD which displays the camera settings (with corresponding buttons to adjust said settings), as well as the number of shots remaining. It's also where you refill the film and remove/replace the rechargeable battery. The battery can take around 100 shots on a full charge. The small viewfinder gives you an approximate representation of what you're taking a picture of, but the real novelty here is that you don't know what it'll look like until the print develops before your very eyes (which takes around 1-2 minutes). Despite being made of plastic it's reassuringly solid, we had no reservations throwing it loose in our rucksack. If you are worried about damaging it, Leica offers some attractive leather cases for some extra protection. While the 60mm f/12.7 (34mm equivalent) is no Summilux, it can still render some pleasing results. There are three focus steps (Macro, Standard, and Landscape) and eight shooting modes (Automatic, Selfie, People & Party, Action & Sport, Bulb, Macro, Self-Timer, and Double Exposure). The Sofort uses ISO 800 Instax film which measures 62mm x 46mm. You can buy this from Fuji with a white border, or from Leica with a slighter warmer white border. Leica's Colour film costs £9.50 for a pack of 10 prints, or £15.50 for 20. Which isn't terribly overpriced. We had the camera set to automatic most of the time, and it handled most situations really well - including strongly backlit subjects. No pixel peeping here, please. Taking pictures is a very fun process, you give a certain amount of thought into taking them (as prints are limited), and once you press the shutter button you eagerly await to see how it turns out. Okay, so, should you buy the Leica Sofort? That's a very tough question to answer - it's a fun camera to use, it's incredibly stylish, well made and very desirable. But it won't take better images than the much cheaper Fujifilm Instax Mini 8 (which costs around £60). The Leica Sofort costs £230, that's a considerable premium, but this is a camera you buy with your heart, not your head, and we expect it to feature on a lot of Christmas wish lists this year. What about the best mirrorless cameras?